We now sell the amazing CPS Telecom CP183, CP228 and CP226 walkie-talkie radio range. Click here for our CPS RADIOS PRICE LIST. The tiny CP183 weighs only 65 grammes and measures only 75mm x 42mm x 15mm - small enough to sit on the palm of a hand, yet it is a full-featured UK-legal PMR446 licence-free walkie-talkie. These are ideal walkie-talkies for use where users do not want to carry around a big chunky "security guard" style radio. They are suited to environments such as schools, retail, restaurants and hospitality. 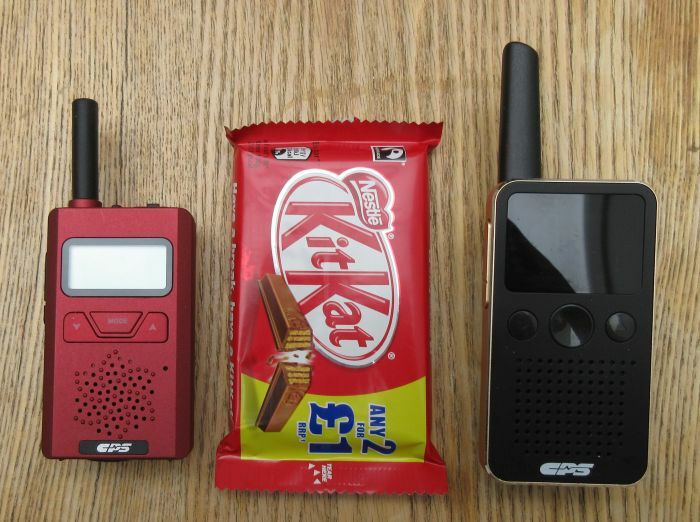 Radio users can easily place either of these compact little walkies into a pocket, or clip them to a belt or other clothing using the belt-clip on the back of the walkie-talkie. These miniature walkie-talkies each come with a rechargeable Li-ion battery pack, which is removable, so spare batteries can be inserted, and a USB charging lead and mains plug adapter. They also have a battery charger, so spare batteries can be charged separately from the walkie-talkie. The compact CP228 is a radio that would be at home in use by staff in upmarket shops, restaurants, hotels, galleries etc. It weighs only 95g and measures only 85mm x 45mm x 20mm. It has a very clear, easy-to-read backlit display, and many handy features including VOX (voice activated transmission), battery state display, 38 CTCSS codes and a standard earpiece connector socket. For both of these remarkable little walkie-talkies, we have a range of accessories for sale, including battery packs, multi-chargers and earpiece/microphones. Click on any of the images below to go the individual product page where you can buy online at our web shop.